It took more than a billion gallons of toxic waste pouring into Tennessee’s Emory River in 2008 to awaken federal and state regulators to the growing problem of disposing and storing coal ash, the by-product of burning coal. That spill, which has now cost more than a billion dollars to clean up, led to the realization that the country had more than a thousand ponds, half unlined, holding coal ash and toxins seeping through the ground and leaching into drinking water supplies. That includes 37 ponds in North Carolina, 29 of which the Environmental Protection Agency has rated “high hazard” — where a spill has the potential for catastrophic damage and loss of life. Sixteen of those sites have been identified as contaminated. But regulators here and elsewhere have been slow to act while the number of spills and related incidents continues to grow. Only after activist groups filed a lawsuit against the EPA, settled in January, are federal regulations for the storage of coal ash coming into effect. And sadly, only after 82,000 tons of coal ash spilled into the Dan River in early February, has the state been forced to realize it has a critical environmental problem on its hands. 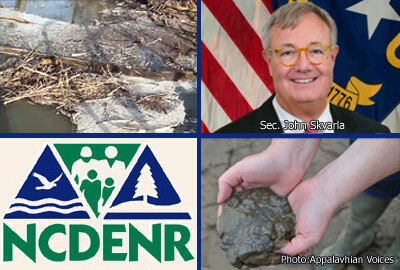 When John Skvarla took the reins at DENR in January 2013, he brought with him years of experience in helping companies mitigate environmental hazards and avoid regulatory interference. Skvarla also brought with him an environmental protection view that frightened many in the conservation sector. In a memo released soon after his appointment, Skvarla professed some doubt about the science underlying claims of global warming and other concerns and announced an agency mission statement along the same lines. “Environmental science is quite complex, comprised of many components, and most importantly, contains diversity of opinion,” that statement reads. And he made clear that, consistent with the McCrory administration’s attention to “customer service,” companies he viewed as overburdened by government regulation would find a welcome voice at his newly reconstituted agency. Everything DENR would do would involve some consideration of economics, Skvarla said in a talk given at the conservative John Locke Foundation in Raleigh. Skvarla pushed out veteran environmental regulators and announced a reorganization of DENR, which had already been fairly denuded by state GOP lawmakers in 2011 and 2012. He hired industry insiders, including people from Duke Energy and Progress Energy for top positions. George Howard, Skvarla’s business partner at Raleigh-based Restoration Systems, was appointed to the N.C. Mining and Energy Commission last year by the legislature. Gov. Pat McCrory later tapped Howard for the Interstate Mining Commission. In the meantime, others at DENR jumped ship, including Susan Wilson, a 24-year employee who quit her job in September by way of an email to Skvarla with a video of the song “Take This Job and Shove It” attached. Against that backdrop, environmental groups like the Charlotte-based Catawba Riverkeeper Foundation knew they faced an uphill battle trying to get DENR to require coal ash cleanup at plants across the state and expected that such action would only come through their own efforts suing violators. They had done just that in South Carolina in 2012, when regulators stepped aside while the foundation sued and then reached a settlement with South Carolina Electric & Gas requiring the company to remove 2.4 million tons of coal ash from the Catawba-Wateree River near Columbia. In January 2013, the groups sent DENR a required 60-day notice demanding that the agency enforce the Clean Water Act against Duke Energy for groundwater contamination at its plant in Asheville or the groups do so themselves through private litigation. Fifty-nine days later, DENR filed suit. In March, the groups sent DENR a similar notice for contamination at Duke’s Mountain Island Lake site, and again, on the 59th day, DENR filed suit. What happened over the next few months demonstrates that the agency prized protection of Duke Energy interests over critical environmental issues, advocates said. In July 2013, the agency announced a proposed settlement of its two lawsuits against Duke Energy which included a penalty under $100,000 and no agreement to remove the toxic coal ash. None of the environmental groups who’d sought enforcement in the first place and who represented the interests of those affected by the contamination had any involvement in negotiating that settlement. Dismayed by DENR’s tactics, which they characterized as designed to cut out involvement by those most affected and shut down enforcement quickly, the groups pushed the court for continued involvement. Public reaction to the proposed settlement during the summer of 2013 overwhelmingly opposed the DENR proposal. In fact, of the nearly 5,000 comments submitted, only one supported the agency’s plan. Some called the penalty amount laughable, and many demanded that immediate and thorough cleanup of the sites be required. Certainly when compared to actions in other states, a penalty below $100,000 for contamination at two sites, particularly against a company worth billions like Duke Energy, is miniscule. In August 2012, state regulators in Pennsylvania extracted an $800,000 penalty from First Energy for one coal ash contaminated site there. And in May 2013, regulators in Maryland assessed GenOn Maryland $1.9 million in penalties for violations at three of the company’s coal sites there. According to Holleman, companies should have to pay a penalty that goes beyond just a cost of doing business. “Somehow you’ve got to get the attention of a big bureaucracy like Duke Energy which is locked into this inertia of storing coal ash in a very primitive, antiquated and illegal way,” he said. But the penalty is not the group’s focus now, especially in light of the Dan River spill. The proposed settlement of the Asheville and Mountain Island Lake lawsuits is off the table, and the environmental groups now parties to those actions as intervenors will be pushing for comprehensive relief at those sites, as well as at Duke’s 12 other coal ash sites across the state which, as of August, became the subjects of lawsuits as well. The state admitted in its August lawsuit that the lagoons at Dan River were contaminated and presented a serious threat to public health and water resources, but then did nothing afterwards, he added. Citizens of this state have an environmental catastrophe on their hands, Duke Energy has a financial and legal debacle to address, and DENR has a customer service problem.